Ghee, a form of clarified butter seems like a new phenomenon, but it is not. It has been an integral part of Indian culture since eons. Literally. It is mentioned in Vedas and mythological legends from thousands of years ago. Only now Ghee is finding a strong following outside India. Back home it is the definition of ultimate culinary indulgence. For some (ahem, me) it is something that they can’t live without! 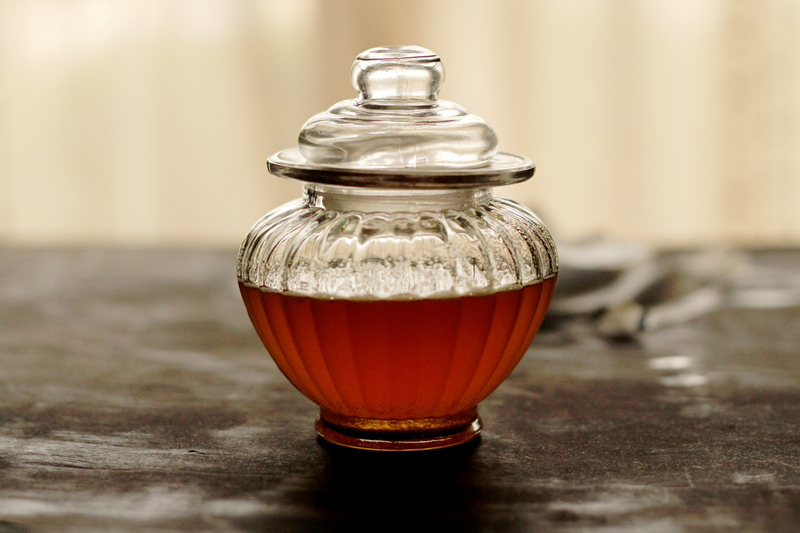 Ghee, especially made from cow milk is considered very auspicious in Indian culture. So much so that it is used in worships at homes and temples. Ancient temples have the distinct aroma of ghee burning in lamps imparting inimitable calmness and serenity. Ayurveda (Indian Root Medicine) considers Ghee as an elixir for long life and advocate regular consumption. I believe the claim to some extent considering that Ghee has higher smoking point and hence may not decompose into carcinogenic components as easily as other lower smoking point oils. Further the heating of butter and draining off the milk solids apparently removes lactose as well. I even heard claims that Ghee consumption leads to weight loss. I don’t know about that because it is still a fat! So common sense says eat Ghee, like anything else in moderation. It adds a homey aroma and nuttiness when drizzled over anything from pastas to rice and daal (lentils) to desserts. In everyday life Ghee is so intertwined that there is hardly a meal without using it as a component, either while cooking or while eating. Even for infants as soon as they are ready to eat solids, ghee is introduced. Rice and daal (lentils) mushed together along with some ghee and salt is the everyday food for babies. 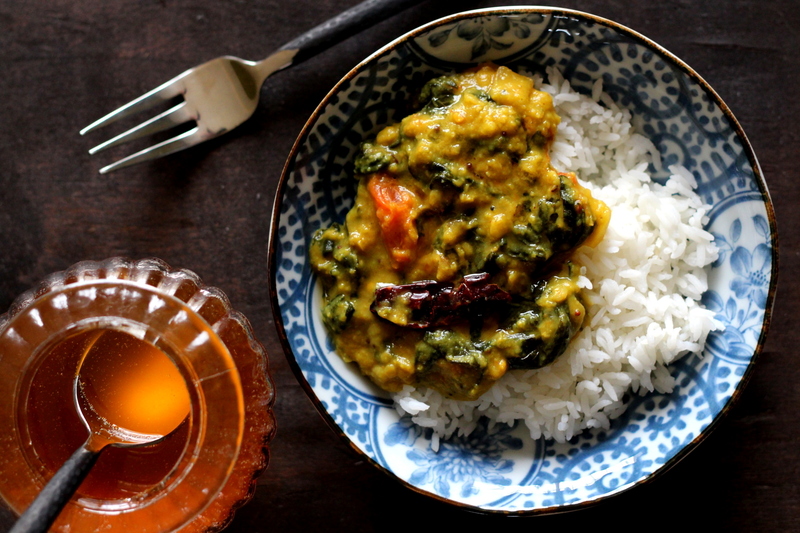 In traditional South Indian meals rice with dal and ghee is a must. And that is how I mainly eat it besides using it for shallow frying nuts and dry fruit for Indian desserts and garnishes. I use Ghee to remedy chapped lips, especially on my kids. Nothing to worry even if they lick it off! 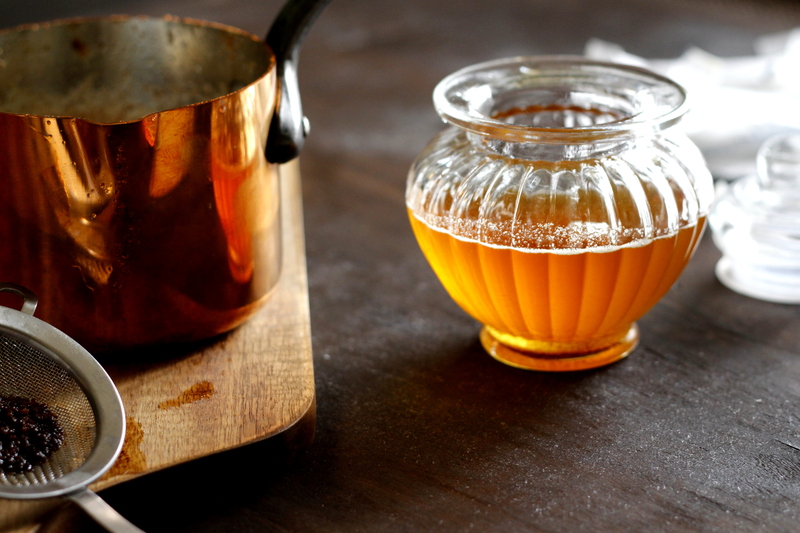 Making ghee is ridiculously simple. All you need is unsalted butter and a watchful eye to avoid it from turning from golden brown to overly brown which can happen rather quickly. 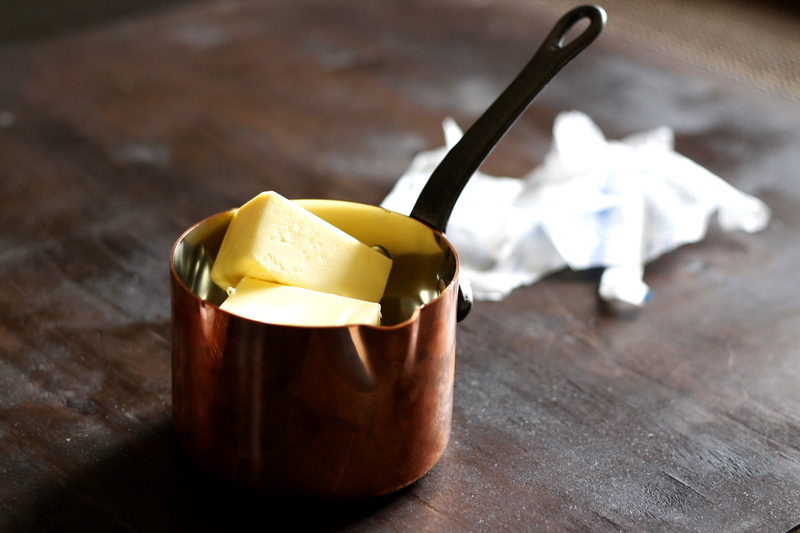 Remember, Ghee is not just clarified butter, where the butter is melted and heated until the moisture escapes. Ghee needs a bit more simmering which is exactly what that coaxes the nuttiness and distinctive aroma out of melted butter. In a heavy-bottomed saucepan, add butter and melt it on medium-high heat. Once most butter is melted, reduce the heat to low and let it simmer for 8-10 minutes. It foams as milk solids are cooked and moisture evaporates. Simmer until you see a nice golden color and a nutty aroma wafts. You may have to break up the foam on top a little to see the liquid below. Remove from heat. If you don’t remove at this stage, it will turn into a darker color. Still good and has more nutty flavor. Cooking beyond that point makes it slightly bitter and acrid. Strain the ghee into a clean and dry container free of odors. Let it cool down before closing the lid. Ghee solidifies at room temp (especially in Winter). It can be left on the counter and stays good for up to 3 months. That is, if you can let it last that long. Drizzle a teaspoonful on piping hot rice and daal. Heaven!! This entry was posted in International, Vegetarian and tagged clarified butter, comfort food, daal, Ghee, Rice, Vegetarian. Bookmark the permalink.